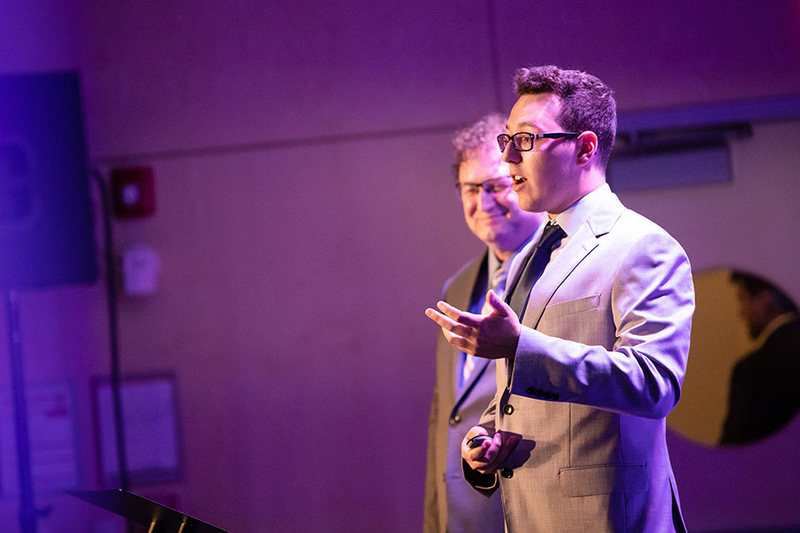 Brandon Hudson, a fourth-year student in RIT’s School of Individualized Studies, and his team representing Connexus won $250,000 in New York state’s 76 West Clean Energy Competition. Hudson, seen here presenting during the competition, is CEO of the heating and cooling company in Venture Creations that has developed a unique web-based thermostat system. Rochester Institute of Technology student-entrepreneur Brandon Hudson is finding success thanks to original thinking and his desire to transform the energy landscape for HVAC customers. On Sept. 25, Hudson, a fourth-year applied arts and sciences major in RIT’s School of Individualized Study, and his team representing Connexus were awarded $250,000 at the 76West Clean Energy Competition, sponsored by the New York State Energy Research and Development Authority (NYSERDA). Connexus is a heating and cooling control and monitoring company that offers a suite of products designed to simplify the installation of any HVAC system and create unique whole-home solutions. The company offers an Internet of Things (IoT) platform for HVAC contractors that streamlines installation, maintenance and management for customers—while reducing costs, time and energy consumption. The 76West competition, which offers winners $20 million in prize money and support services, is focused on growing entrepreneurs and attracting resources from the United States and around the world to build clean-energy businesses and jobs in New York state’s Southern Tier region. Earlier this month, Hudson became the first student selected for RIT’s Gap Year Entrepreneurship Fellows Program, which allows students with an ongoing enterprise to take a year to focus their full attention on the venture. As students develop their companies, they will receive $15,000 in support and mentoring from experts at the university, all while continuing to make progress on their RIT degree. The fellowship is made possible as part of a $50 million donation made by 2009 RIT alumnus Austin McChord, founder and CEO of Datto. The program is also offered through RIT’s School of Individualized Study, in collaboration with RIT’s Simone Center for Innovation and Entrepreneurship. No stranger to running a company, Hudson began his entrepreneurial ventures as a first-year RIT student with his business Click, a watchband adapter for Apple Watch. Today, Hudson’s parents operate Click so he can focus on his studies at RIT and Connexus, which is a member of RIT’s Venture Creations technology business incubator. The Connexus team also includes Chuck Russo, HVAC engineering; RIT alumnus Eric Schumann, hardware engineering; Bill Cosselmon, mechanical engineering; and John Bisgrove, sales. In addition to Connexus, Venture Creations companies Ecolectro, Crystal Creek Organics, Tyll Solar and Molecular Glasses were all named semi-finalists in the competition.